Our high performance LED pattern projectors are the most advanced and efficient devices for pattern projection and structured light applications, such as 3D reconstruction. Unlike laser sources, which typically show poor line sharpness and power distribution inhomogeneity as well as scattering and diffraction effects, LTPR pattern projectors overcome all of these problems by integrating LED sources and precisely engraved masks. Any kind of pattern shape can be easily supplied, integrated and projected by these devices. The projected light path is typically coupled to the pupil aperture of a C-mount lens. When combined with one of our bi-telecentric lenses, the projection area is undistorted since tilting the pattern only causes a linear extension along one direction. Very good results can also be obtained with our zero distortion macro lenses; the magnification changes along both axes, but image resolution and distortion are such that 3D reconstruction can still be easily performed. Although compatible with non bi-telecentric lenses, a square pattern will become a trapezoid in the projection plane. 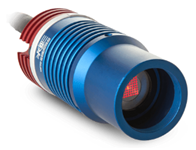 This light is available with 3 watt LEDs, to include: white, 460 nm blue, 520 nm green, or 630 nm red. Input voltage is 12 - 24 VDC. A variety of interchangeable optic patterns are available. Choose from standard line, stripe, edge and grid patterns, or specify the custom pattern ideal for your project. Easily modify the projection area by changing the projection optics. PLEASE CONTACT US WITH YOUR PROJECT REQUIREMENTS AND WE’LL QUOTE THE IDEAL SOLUTION.